Before string theory introduced the concept of extra dimensions, the fascination with strange warping of space in the 1800s was perhaps nowhere as clear as in the creation of non-Euclidean geometry, where mathematicians began to explore new types of geometry that weren’t based on the rules laid out 2,000 years earlier by Euclid. One version of non-Euclidean geometry is Riemannian geometry, but there are others, such as projective geometry. 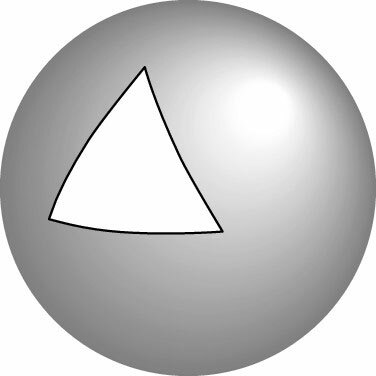 The reason for the creation of non-Euclidean geometry is based in Euclid’s Elements itself, in his “fifth postulate,” which was much more complex than the first four postulates. The fifth postulate is sometimes called the parallel postulate and, though it’s worded fairly technically, one consequence is important for string theory’s purposes: A pair of parallel lines never intersects. Well, that’s all well and good on a flat surface, but on a sphere, for example, two parallel lines can and do intersect. Lines of longitude — which are parallel to each other under Euclid’s definition — intersect at both the north and south poles. Lines of latitude, also parallel, don’t intersect at all. Mathematicians weren’t sure what a “straight line” on a circle even meant! Gauss passed the majority of the work off to his former student, Bernhard Riemann. Riemann worked out how to perform geometry on a curved surface — a field of mathematics called Riemannian geometry. One consequence — that the angles of a triangle do not add up to 180 degrees — is depicted in this figure. When Albert Einstein developed general relativity as a theory about the geometry of space-time, it turned out that Riemannian geometry was exactly what he needed.